Did Somebody Call a Web-Slinger? Look out! Hot on the heels of 2017's "Spider-Man - Homecoming," here comes a brand-new silver dollar featuring everyone's favorite wall-crawler! The artisans at the Perth Mint have minted another gorgeous hit, but just like Peter Parker himself, there's more to this silver stunner than meets the eye! WEB-TACULAR DESIGN -- Drawn from the new Disney XD Spider-Man series, the superteen himself takes center stage on the coin's reverse in prime web-shooting position. Look even closer and you'll see a gorgeously intricate design struck on three different levels with THREE DIFFERENT FINISHES on a mint state coin! It's a multilayered coin you have to see to believe! SUPERB SILVER -- Each coin is minted in one ounce of highly-pure 99.99% fine silver by the acclaimed Perth Mint. 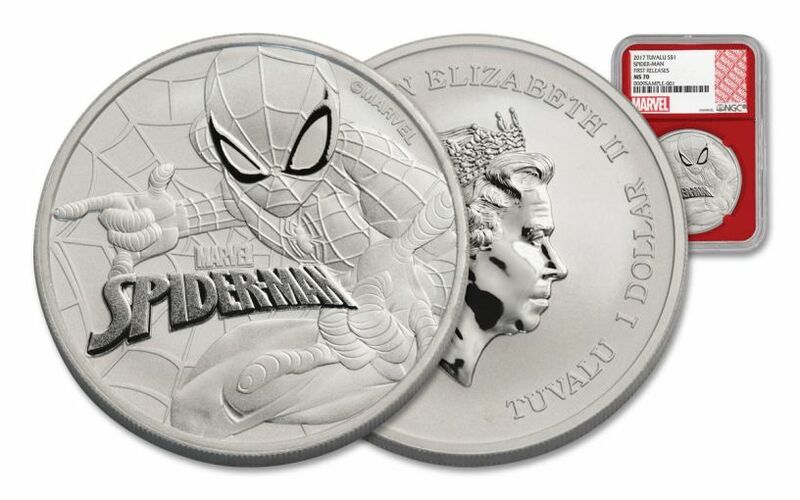 LEGAL TENDER -- This Spider-Man coin is legal tender one dollar for the island nation of Tuvalu. 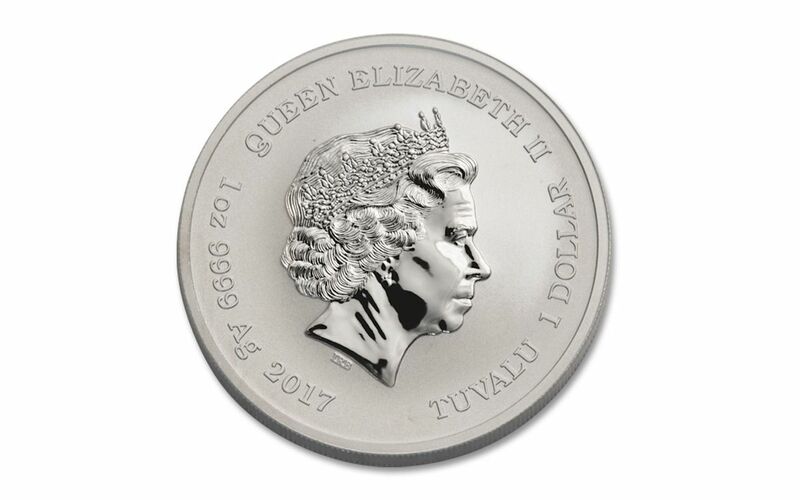 All the details, along with the coin's silver content, are engraved on the obverse along with Ian Rank-Broadley's profile of Her Majesty Queen Elizabeth II. AN OFFICIAL MARVEL COLLECTIBLE -- This silver coin is the real deal, featuring the Marvel logo and copyright. CERTIFIED FLAWLESS AND FIRST RELEASES -- Your coin will also come graded Mint State-70 (MS70) by Numismatic Guaranty Corporation (NGC), a distinction that means your perfectly-graded Spider-Man coin will have ZERO imperfections -- showing all features and fields exactly as the engraver and mint intended! 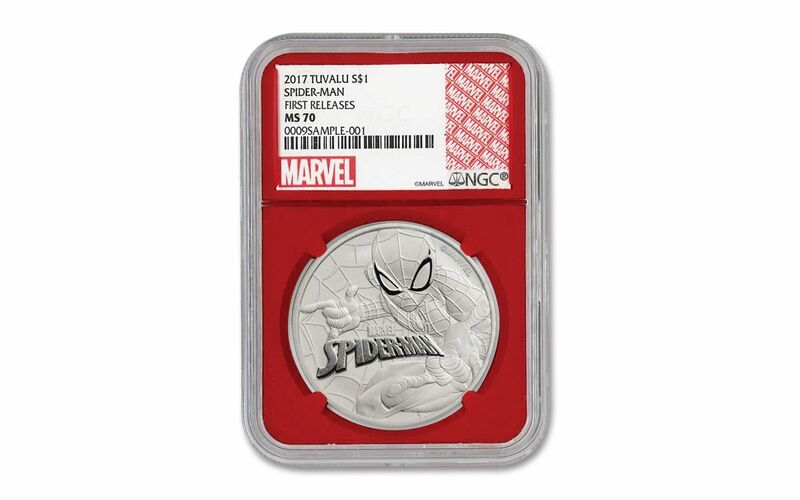 Your Spider-Man coin will also be certified First Releases (FR) by NGC, meaning that it was among the first struck by the mint and was verified within the first 30 days of issue. A SPECIAL RED DISPLAY CORE -- In addition, your Spider-Man coin will be sonically sealed in an acrylic case with a special red display core -- giving you the best in protection while granting clear sightlines into every beautiful detail -- all delivered inside a red pouch with a black web design. For over 55 years, Spider-Man has been spinning webs everywhere from comic books to cartoons to movie screens -- and his fans always want more! And, as Stark Industries' newest intern (and Marvel Cinematic Universe addition), his latest film adventures are just beginning! 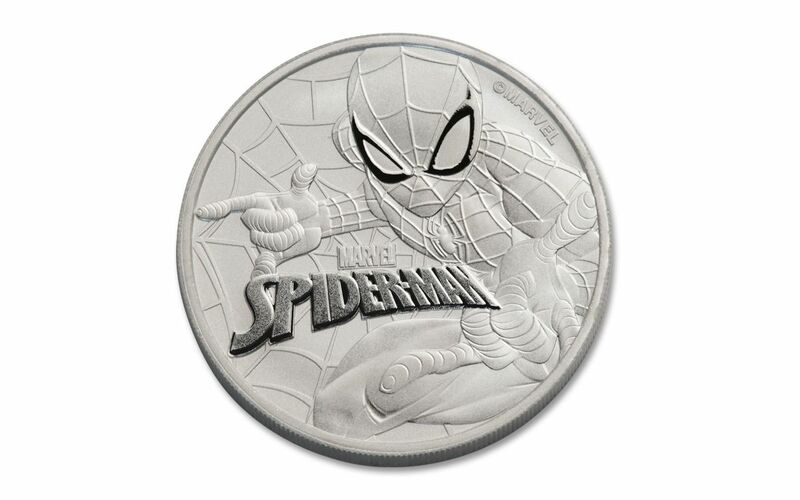 Trust your Spidey Sense and snag this coin for your very own today!